Anyone go with this option? Seems nice, but maybe a little pricey for what it is at $1583 before discount. If you don’t go with this, is it just finished fiberglass in the color of your deck base? Yes it will be the same color as your deck base/interior gel. Our 2019 came with woven rubber mat similar to the flooring they used to offer a few years ago. Works fine imo. Walls could use some added protection but that’s low on my list of projects. My floors are all black, although my interior color is white. Nautique has the storage areas all covered in SeaDek as a standard option... and across the gunwhales. . I was pretty surprised that when I got the soft grip from the factory for the floor, it didn't include the storage areas. In the large compartment under the port bench, I had a small piece of the woven rubber mat that is placed loosely on the floor. It isn't big enough to cover the entire floor and it also is just thrown on the floor, which slopes, so it does not remain in place. I am searching for the right word to describe my opinion of this. Amateur hour at the Malibu design team headquarters is what comes to mind. Some guys with buck teeth thinking it was cool to make it nice and shiny, not thinking that I am going to drop an anchor in there and everything else. Gatorstep has the kit for the storage compartments of a 25 LSV for $1153. I will likely order it together with the gatorstep for the top of the rubrails. Nautique has the storage areas all covered in SeaDek as a standard option... and across the gunwhales. . I was pretty surprised that when I got the soft grip from the factory for﻿ the floor, it didn't include the storage areas. In the large compartment under the port bench, I had a small piece of the woven rubber mat that is placed loosely on the floor. It isn't big enough to cover the entire floor and it also is just thrown on the floor, which slopes, so it does not remain in place. I am searching for the right word to describe my opinion of this. 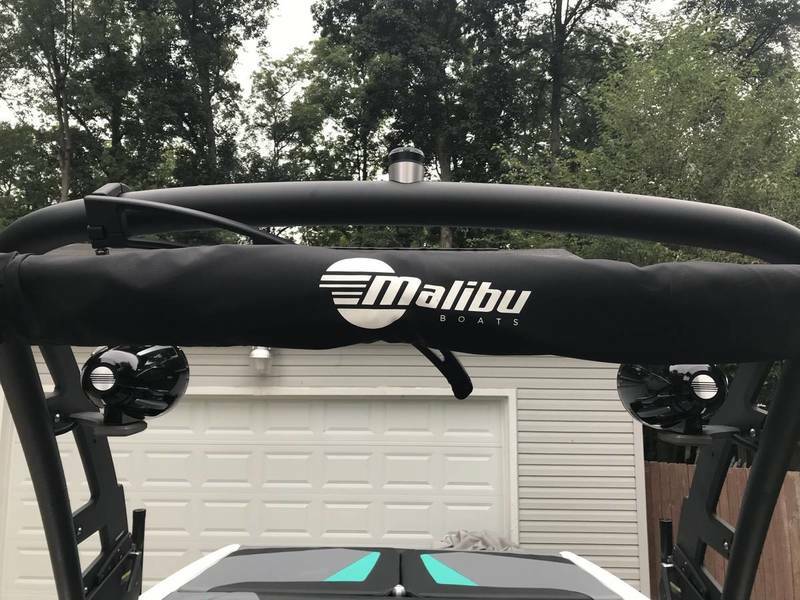 Amateur hour at the Malibu design team headquarters is what comes to mind. Some guys with buck teeth thinking it was cool to make it nice and shiny, not thinking that I am going to drop an anchor in there and everything else. I thought it was a nice feature on the G as well. Just makes you think about it when it’s another $1500 option to pay for. I guess you’re still paying for it on a G, just don’t realize it since it’s “standard”. When you’re trying to keep the cost down you seem to over analyze everything. Still undecided on a couple other things as well like tower speakers and tower mounted mirror. My G had the windshield mounted mirror and it never really bothered me, but some say the tower mounted mirror is a must. That’s interesting. My vtx is still the three piece hull so maybe I wasn’t thinking about this right for the new two piece hulls. The storage areas in the two piece hulls would be the “back side” of the interior and exterior gel I think. So they must finish it off with something. And maybe the pieces of rubber mat in our vtx work because they don’t have as much surface area to cover. Good point for sure. I am torn between complaining about what isn't standard feature and being happy that I didn't get anything extra that I didn't want. I was not told that I would have to pay extra to get the storage areas lined, I really did think that was standard with the soft grip flooring in the main areas, it would seem to go together. That is a miscommunication between me and my salesman. 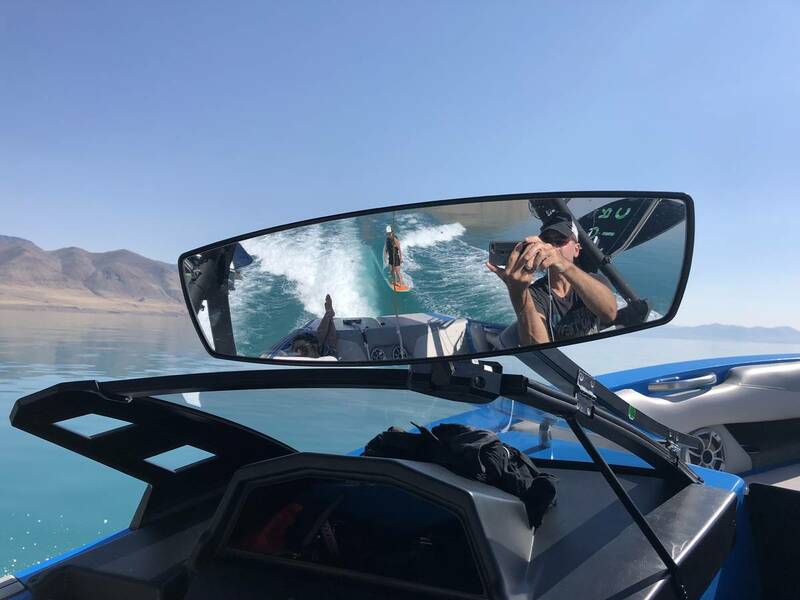 Mirror: can you get the good mirror with a windshield mount? It seemed you couldn't. The stock mirror is pretty puny, and I couldn't imagine going back to it, so I got the better tower mounted mirror like what the G had. I don't think I could go back. 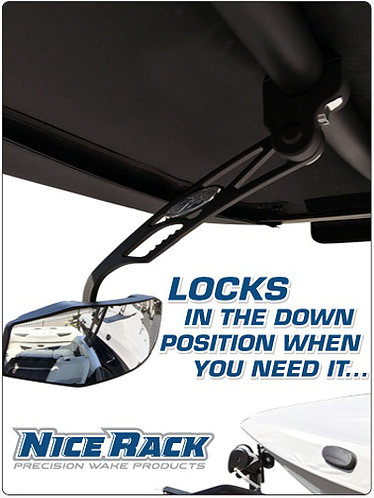 I am still confused what I am supposed to do with the mirror when I am trailering the boat. The dealer turned it awkwardly sideways, which I think it about all you can do with the tower mount the way it is. Tower speakers were way overpriced, so I am doing my own. I then get to actually play with amp settings. I enjoy stereo installation and also enjoy doing my own tuning, so that was a nobrainer in my book. I would think an aftermarket stereo shop with some experience in this could do better for cheaper as well. You can get the big PTM mirror for a windshield mount. It's difficult to find a place to mount it IME. It's hanging over the walkway or hitting the other winddshield when on the walk through window. I have found after several of these tower mounted mirrors to mount them as far Starboard as possible so they wont hang over the walkthrough. Also, put Loctite on the mounting screws for the tower bracket. They will loosen up over time and when the tower bracket rotates on the tower tube, it will scratch the tower finish. I don't tow except to the dealer and back but I take the mirror arm off the tower bracket and leave it in my truck on those trips. Windshield mount on the port side is money. 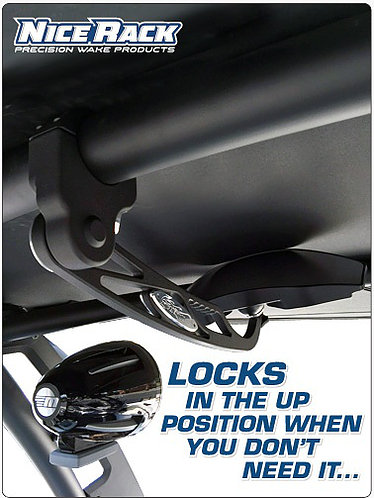 Doesn’t shake, doesn’t obstruct view forward, driver doesn’t obstruct view rearward, easy to reach and adjust. BUT...it's hanging over the walkthrough. Everytime someone walks through there, they "Accidentally" bump the mirror. If you're OK with that, I am too. If you are using the windblock like you are in the pic, it's a non issue. Yeah that is totally a nonissue for us. The bow doesn’t see a ton of use. Not to mention that everyone will readjust the mirror to their preferred angle anyhow, and readjust between disciplines too. we aren’t really a “full figured” crew either, so this hasn’t really posed a space constraint. Mine is mounted like that further to the left so it doesn’t get bumped either. The glass on the window extends all the way to the edge on my 2019. Is it Ok to put the PTM mount on the glass itself? The bimini is in the way to easily remove it each trip. And I do trailer every time I go out, so removing it begins to be 'one more thing' that makes it less fun to just get up and go. On longer road trips I take my mirror and arm all the way off and store it in observer compartment wrapped in towels. It's only one bolt with a handle to remove the arm, so it takes very little time but saves me from wiping a ton of bugs off. Is it my extended bimini that puts about 5 mm between the bimini and the handle? Then as soon as I start to move the handle, the bolt hits the bimini crossbar. It is not easy to remove for me. FWIW I folded my tower arm up like this behind the bimini for a few long trips this year. Worked well and minimal bugs on it. I think so but that would be a good Q for PTM. Now that this has turned into a Mirror thread... does anyone know if the tower arm mount for the G3 works on the Gx? I am guessing yes as they both have the hoop. We have a Group Buy coming up for Nice-Rack.com if you like their mirror arm better. This is an interesting albeit costly option ...What arm or arms have folks used to mount a PTM 140 to an illusion XS tower? Or the windshield? 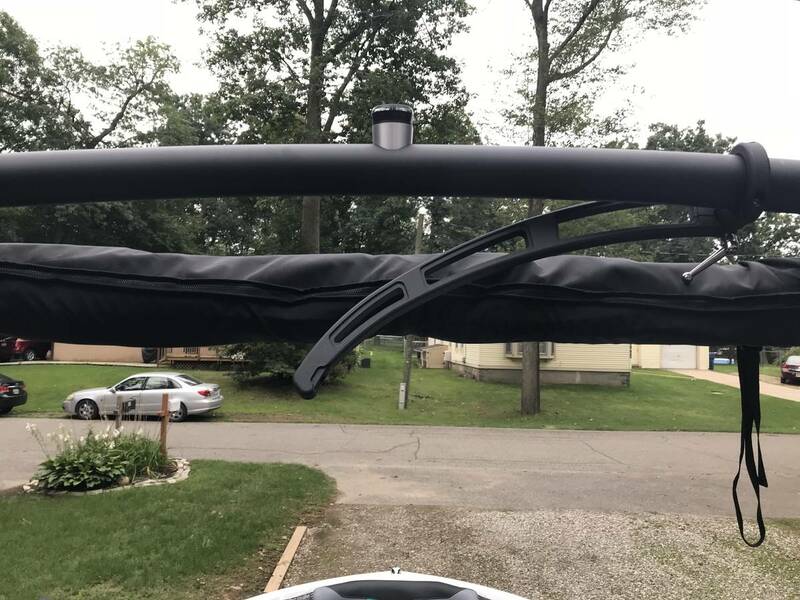 Does the windshield mount fold straight down and out of the way easily when covering?